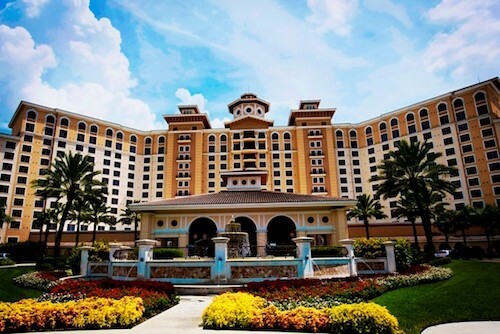 Today, the troubled for-profit college industry's troubled trade association, APSCU, begins its four-day annual convention, at the Rosen Shingle Creek resort in Orlando FL. Unlike past years, there is no big name keynote speaker, no George W. Bush, Jeb Bush, or Newt Gingrich, and no dance party with a semi-faux version of the Beach Boys or Kool and the Gang. The optics are more stripped down, and the mood, judging by the conference agenda, is more downbeat. APSCU has waged a long campaign against efforts by the Obama Administration to hold its member schools accountable for waste, fraud, and abuse with your tax dollars. The group has been fighting, in effect, for the most irresponsible for-profit college operators, and thereby undermining opportunity for those owners who would like to succeed by genuinely helping students to train for careers. But APSCU is on a long losing streak, and it has lost many of its members and much of its funding and staff. Many of APSCU's former members -- including Corinthian Colleges, Education Management Corp. (EDMC), ITT Tech, Kaplan, Career Education Corporation, DeVry, Bridgepoint Education, ATI, and FastTrain College -- and some of its current members, like the schools owned by Carl Barney and APSCU's long-dominant figure, Arthur Keiser, have in recent years been under investigation or taken to court by law enforcement agencies for deceptive practices. Many of the companies that haven't closed down are in free-fall, their bad deeds exposed, with collapsed enrollments and earnings, shuttered campuses, ousted CEOs, and departing executives and board members. The latest blow to APSCU's industry was a widely reported study published late last month by the National Bureau of Economic Research that concluded that for-profit college students -- graduates and dropouts combined -- earn less after leaving school than they did before they enrolled. Last Thursday, APSCU lost yet another battle in its effort to block the Obama Administration's gainful employment rule, which will, eventually, cut off federal aid to career college programs, non-profit or for-profit, that consistently leave students with debts they cannot afford to repay. The U.S. Court of Appeals for the District of Columbia Circuit rejected APSCU's petition for a rehearing, by the full coterie of judges on the court, of a decision by a three-judge panel that sharply rejected APSCU's challenge to the rule. APSCU still has options for attacking the gainful employment rule, and using expensive lawyers, lobbyists, and campaign contributions, it is likely to pursue them: (1) seeking review of its lawsuit in the U.S. Supreme Court; (2) pressing Congress to overturn the regulation; and (3) pushing to make the President of Trump University the President of the United States. I doubt APSCU's barons will prevail, but they probably will keep trying, primarily using taxpayer dollars -- many APSCU members get close to 90 percent of their revenue from federal student grants and loans. While many of the big predatory colleges quit APSCU after the group failed in its lobbying mission, some honest owners of better-performing, often smaller, career colleges have told me they had already left in disgust because the group had become so dominated by arrogant, misbehaving schools and owners. APSCU titan Arthur Keiser engineered a conversion of his school to non-profit status in an arrangement so questionable and so profitable for Keiser that it was featured in a front-page account in the New York Times. Jack Massimino, the CEO of notoriously predatory Corinthian Colleges, was, until his company's collapse, the chair of APSCU's political action committee. Our country desperately needs stronger career education programs -- to offer opportunity and the chance for good jobs to single parents, returning veterans, immigrants, and others struggling to get ahead. So it's a terrible shame that unscrupulous for-profit college operators, often dominated by Wall Street and private equity owners, have bent, broken, or lobbied out of existence key accountability rules in order to maximize their profits while minimizing educational quality. Cynical predatory schools have taken tens of billions annually from the federal financial aid pot, diverting resources from better options and driving a massive student debt crisis. Thousands of students across the country have enrolled based on deceptive and coercive recruiting pitches and had their financial futures ruined. And despite all the blows the industry has suffered lately, that is still happening today. APSCU has been a key engine for this race to the bottom. Students, taxpayers and college operators who want to do the right thing all deserve much better. So let's look briefly at what APSCU plans to talk about this week in Orlando. The whole agenda is posted, and I have pulled out some key sessions and added some annotations. While APSCU keeps fighting to get rid of the gainful employment rule entirely, the conference will include a couple of sessions advising on how to deal with the rule. While one session title does include the concept of "improving ... compliance" with the rule, it looks like some session time will be used by lawyers to explain how to contest Department of Education findings that could lead to rule violations. For-profit colleges already are expert in evading another key Department of Education requirement -- that they avoid extremely high student loan default rates. The point of the default rate law, like the gainful employment rule, is to penalize schools that overcharge and under-educate, thus leaving students with overwhelming debt. Unfortunately, many for-profits have pursued a strategy other than offering better value; instead they hire firms that specialize in getting broke former students on the phone and offering them gift cards or other inducements to place their loans into artificial "forbearance" status. That shift actually does nothing for the student, because interest keeps accruing. But the school can then report one fewer loan in default and help protect its flow of federal aid dollars. Debt collection agency USA Funds, headed by former George W. Bush deputy education secretary Bill Hansen, boasts that it provides such forbearance advising / debt "aversion"; its VP will address APSCU attendees on this subject. The newest industry obsession is the Obama Administration's planned standards for forgiving loans of students who were defrauded by their schools, along with requirements that schools that have engaged in troubling behavior post bigger letters of credit. The for-profits are concerned, indeed offended, that they, not taxpayers, might be required to bear some of the financial costs of their deceptive practices. Lawyers Cariello and DeLuca represented the for-profit colleges in Department of Education negotiations aimed at producing a new set of rules. Like those lawyers, the Cooley law firm regularly represents for-profit colleges; last fall it wrote to the Department to question whether the government would have authority to recover forgiven student debts from the colleges involved. "Today's Difficult Times" -- ouch. These seem like the big enchilada sessions and feature an interesting cast of characters. Peter Leyton is a dedicated for-profit college lawyer who has dismissed industry whistleblowers as simply "disgruntled." Lawyer Tony Guida is smart and one of the nicest people I've met in this industry, but it's still unclear why this meta-discussion should be led by a former top in-house lawyer for both troubled EDMC and Corinthian. Scott Shaw's company, Lincoln Educational Services, recently paid $850,000 to settle claims by the Massachusetts attorney general that the company engaged in "deceptive practices" that left students "financially ruined." Avy Stein is the private equity baron who, according to former Senator Tom Harkin, promised to "make life rough" for the Senator if he proceeded with oversight of for-profit colleges. (Stein denied saying that, and Lincoln Educational Services denies doing anything wrong.) Mushtaq Gunja is the only government official listed on the agenda and has been active in Department of Education oversight efforts. It would be interesting to find out what he says; unfortunately, APSCU is apparently barring the media from that particular session. Accreditors of for-profit colleges are under fire after years of approving programs that now have been exposed as predatory. Panelist Tony Bieda, who became the acting head of the accreditor ACICS when the incumbent suddenly resigned, is facing a huge challenge; last summer Senator Elizabeth Warren unleashed a blistering attack on ACICS for its apparent lax oversight of Corinthian, and thirteen state attorneys general and others have called on the Department of Education to end recognition of ACICS as the Department prepares to convene a key accreditation meeting this month. Signing up new students, also known in the industry as "starts" or "pieces of business," and depositing their federal aid checks, remains the main focus of the for-profit education "sector," so there are multiple sessions at APSCU on acquiring the necessary leads, for which these colleges continue to pay handsomely. The Federal Trade Commission has been examining and now has begun disciplining for-profit college lead generators who engage in deceptive bait-and-switch tactics. With the Obama Administration and federal and state law enforcement agencies continuing to crack down on predatory for-profit college abuses in the United States, and the media continuing to educate U.S. audiences about these practices, operators are dusting off their passports and looking for more lax regulatory environments and new prospective students overseas. That's maybe why international. Note that APSCU boss Keiser is teaching this session himself. 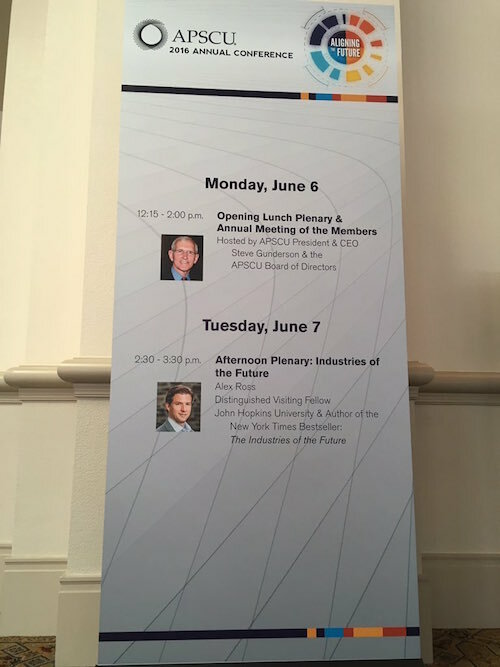 A lower profile plenary speaker than in past years, but perhaps APSCU sees this as an investment in the future. Alec Ross, who is promoting a new book, worked for the 2008 Obama campaign and then served in the State Department as Hillary Clinton's Senior Advisor on Innovation. Ross now serves on the advisory board of Leeds Equity Partners, which is run by APSCU board member, former EDMC board member, and long-time for-profit college investor Jeffrey Leeds; another board member is former Bill Clinton White House chief of staff Thomas F. "Mac" McLarty.